The Business Feasibility Study for Excel is an integrated collection of Excel templates designed to simplify the creation of business plans with financial projections for feasibility analysis. The professional reporting output is designed to relay accurate and detailed feasibility study information for venture capital presentations and corporate financial decision making purposes. Comprehensive accounting statements and financial projections provide cash flow forecasts for up to 7 years. Analytical reporting is suitable for a wide range of decision making purposes including strategic planning, capital financing, restructuring, budgeting, valuation and scenario simulation for all business types. Pro forma income statements, cash flow analysis and ratios are presented as monthly for two years and then annually for a future 5 years thereafter. The business feasibility study accommodates two sets of assumptions to compare alternative scenarios or propose business and investment opportunities. The required funding for the investment project is accurately calculated in order to quickly determine the feasibility of the business. Financial calculations adhere to IAS, IFRS or German accounting standards to create trustworthy and standardized pro forma accounting statements. Exchange rates and currencies can be changed to view the business feasibility analysis in multiple currencies. 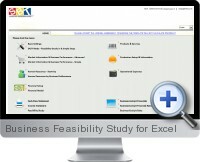 The Excel Business Feasibility Study template is compatible with Excel 2007 or higher.